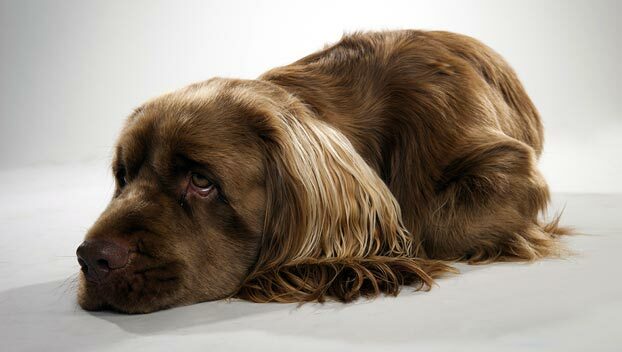 The low-slung Sussex Spaniel has a compact, rectangular body and weighs 35 to 45 pounds. 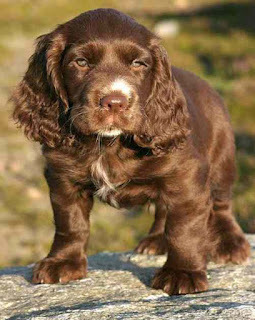 He stands out for his coat color of rich golden liver and his large, sad eyes, so typical of the spaniel family. In the field, he’s slow but steady, beating his way through thick cover to flush and retrieve birds for a hunter on foot. He’s also a super family dog for people who can give him the exercise and firm, but loving guidance he needs. One Sussex recently put the spotlight on the breed, taking Best in Show at the Westminster Kennel Club dog show in 2009 and earning the breed some new fans. He’s highly intelligent but can be stubborn, so he’s not always easy to train. That said, if you find the right motivation — like making use of his super scenting ability — you can teach the Sussex to do almost anything. Train him with positive reinforcement techniques. He is particularly fond of food rewards. Be patient when it comes to housetraining. It can take a long time for a Sussex, especially females, to be trustworthy in this regard. The Sussex is an uncommon breed, with only about 75 puppies born each year, so you may experience a wait of six months or even a year or two before a puppy is available. The Sussex has a small gene pool, which can make it difficult to avoid some health problems. His golden-liver coat is the Sussex’s crowning glory, and the color is unique to the breed. In 1795, Mr. Fuller of Rosehill Park, Hastings in East Sussex, England began breeding gun dogs to work in districts where the terrain was rough and the undergrowth very dense which meant that a spaniel was needed which could give tongue or to alert the hunter on his quarry. 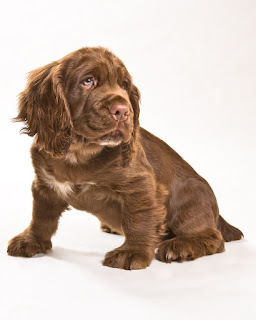 Fuller crossed various breeds such as the liver and white Norfolk Spaniel , the Field Spaniel, and possibly some early English Springer Spaniels. The Sussex was bred specifically to inherit the barking ability that was not common in most Spaniel breeds during this era. In 2009 a Sussex Spaniel named "Clussexx Three D Grinchy Glee," call name "Stump," won best in show at the 133rd Westminster Kennel Club Dog Show. At 10 years old, Stump is the oldest dog to win this title. The breed is more popular in the United States than any other country. It is recognised by the Continental Kennel Club, Fédération Cynologique Internationale, American Kennel Club, Kennel Club of Great Britain, Canadian Kennel Club, National Kennel Club, New Zealand Kennel Club, and the American Canine Registry. Sussex Spaniels are gentle, easy-going, affectionate dogs who enjoy being active participants in family life. They are happy to be lazy on the couch for a relaxing Sunday afternoon, but when they are outdoors the Sussex springs to life, running, leaping and playing like a puppy. These hunting dogs were designed to withstand long days in the field, working in rough terrain and all types of weather. This background gives the Sussex energy to spare, so don't take this little dog for a couch potato. He needs several walks a day and plenty of time to run, but as long as the activity involves the people he loves, he is happy. 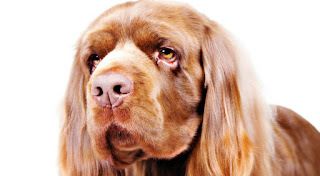 The Sussex Spaniel is good with older children, gets along well with other family pets and makes an all-around fine family companion. 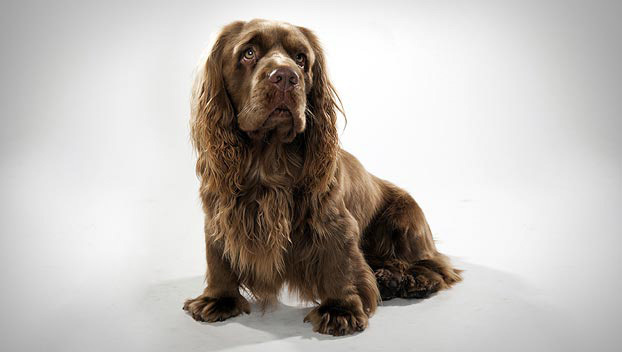 The average life span of the Sussex Spaniel is 12 to 14 years. Breed health concerns may include congenital deafness, ear infections, distichiasis, retinal dysplasia, hip dysplasia, hypothyroidism, patent ductus arteriosus, prostate cancer, pulmonary stenosis and Tetralogy of Fallot. The Sussex Spaniel will do okay in an apartment if it is sufficiently exercised. It is moderately active indoors and a small yard will be sufficient. This breed can live outdoors in temperate climates as long as it has warm shelter, but it generally does better as a house dog that also has access to a yard. The Sussex is an easy going spaniel, but can be difficult to train. Breeders encourage owners to begin training as soon as you bring your puppy home, at about 8 to 12 week of age. Positive reinforcement and treats are the best method use in order to get your Sussex to respond. Harsh discipline will cause your dog to simply ignore you. They are little dogs but they can exhibit dominance, so leadership is an owners 24 hour responsibility. If you bend the rules just once for a Sussex, he will take that as an invitation to walk all over you. Though they can be a handful to train, once leadership has been established and basic obedience has been mastered, you should enroll your Sussex in advanced activities like agility or flyball to keep him on his toes mentally and physically. 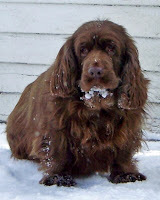 Because the Sussex Spaniel is a hunting breed, it requires a fair amount of daily exercise. 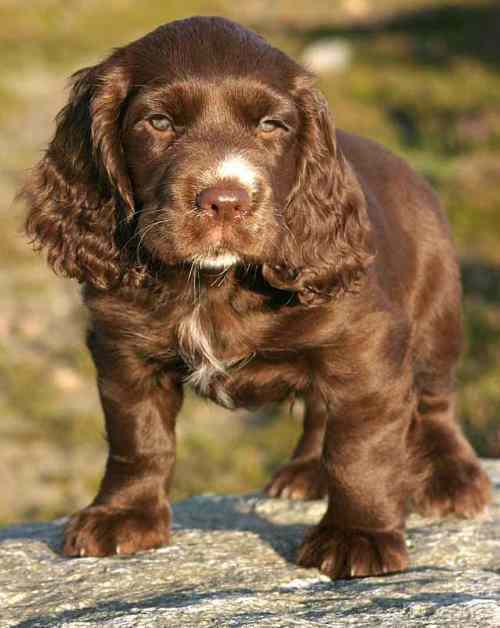 Sussex Spaniels should be given a daily walk as well as plenty of outdoor play time. Lack of exercise for this breed can lead to the development of behavioral problems. The Sussex has an abundant coat that is flat or slightly wavy with feathering on the legs and tail and a pretty frill beneath the neck. The coat can be cared for by brushing at least once or twice a week to remove tangles or mats and distribute skin oils. Bathe him as needed. The Sussex sheds moderately, and daily brushing will reduce the amount of hair that lands on your floor, furniture and clothing. The rest is basic care. Trim the nails as needed, and keep the hanging ears clean and dry. Good dental hygiene is also important. Brush the teeth frequently with a vet-approved pet toothpaste for good overall health and fresh breath. The Sussex is named for the county in England where he was favored as a hunting dog. He was mentioned as early as 1803 in a magazine called "Sportsmen’s Cabinet."